I received this book a couple of weeks ago. I enjoyed reading it, and it is one of the more interesting insights into professional cycling. You feel a strong sincerity in that this is how Geraint Thomas sees cycling and life, there’s no sense of pretence or writing what a pro cyclist is supposed to say. From those looking from the outside, it is interesting to read. 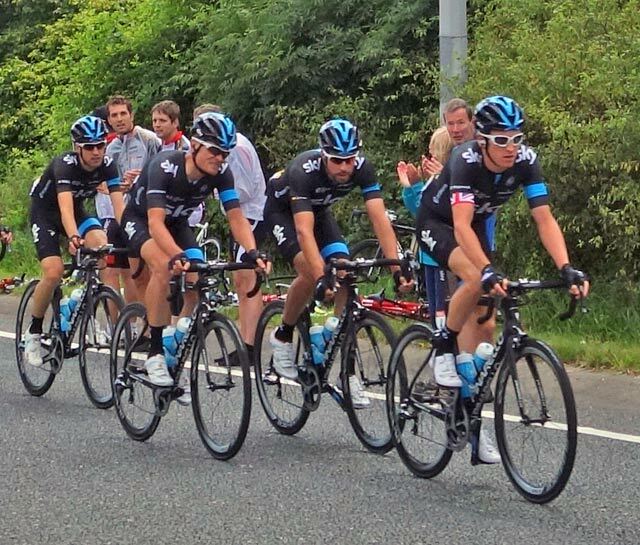 The story of Geraint Thomas’s career is well-timed because it neatly co-incides with the rise of British cycling. Thomas along with the likes of Ed Clancy, Mark Cavendish were some of the very early members of the British Cycling development squad run by Rod Illingworth, the squad which went on to achieve Olympic success and then perhaps more impressively success on the road. The book is written in quite a light, easy to read format; (it is written with Tom Fordyce). It is good humoured and generally quite a positive insight into professional cycling. 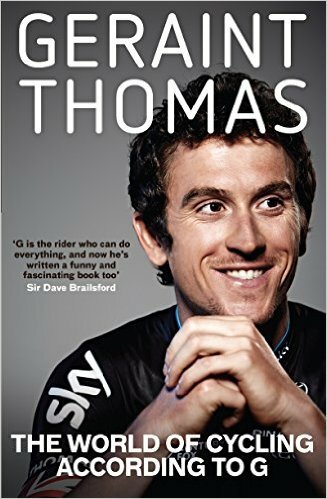 There are also short chapters on other protagonists in the cycling world – Cavendish, David B, Bradley Wiggins, Chris Froome and Chris Hoy. There is also a look at places from the rain swept cobbles of Belgium to the more refined world of Italy. 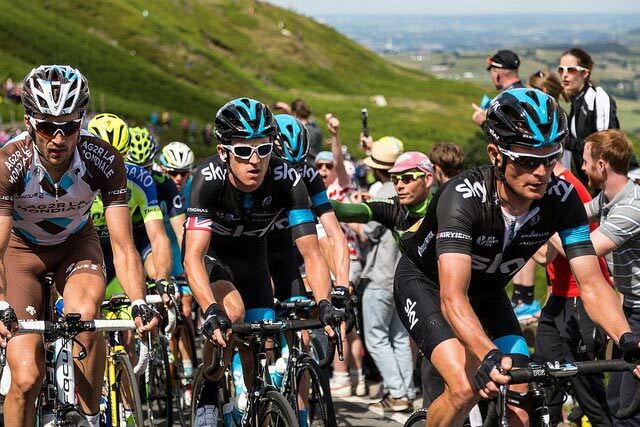 Although it is written in an informal tone, with good sense of humour, you feel like you get an insight into the mindset of Team Sky from someone who has been in it from the start. Such as the strict dieting regime, the training camps on Tenerife and the logistical aspects of being in the biggest Pro cycling Team. For those who aren’t so keen on Team Sky’s dominance and marginal gains, Thomas gives a more human perspective, which is easier to cheer and empathise. I read this whilst doing my last two weeks of training for the national hill climb. I was training relatively little in terms of volume – 3 or 4 hill climb efforts of 4 minutes, then a day of 1 hour recovery rides. The problem is that reading Thomas’ book made me feel I had massively under-trained. I felt completely inadequate as I compared my training with his. It seems for Thomas three hours steady, is like a recovery ride, and a hard day on Tenerife is the amount of climbing I did in two weeks. Of course, the National hill climb (4 mins) is rather different to preparing for three week stage race, but it did encapsulate the difference between a domestic amateur and a full time professional. I’ve always followed Geraint Thomas career quite closely after racing against him in British Time Trial Championship 2010 in South Wales. We finished race at similar time (he probably caught me for about 8 minutes). I didn’t want to bother a professional who (even in 2010 would probably get a lot attention from fans), but he was quite happy to start a conversation and asked about my racing. I told him I did 100 mile time trials which he thought was a bit crazy. But, then I don’t do four hour training sessions on a turbo, so I think honours are even there. Still it is good to see someone make it all the way to the top, but still retain the attitude of a local lad, unaffected by fame. He certainly doesn’t hold back in sharing his pride in being a local Welsh lad from Cardiff. To give an example of an interesting ancedote in the book, there was the time when Chris Hoy won Olympic Gold in Athens (2004). On that day, Chris Hoy had to watch three times as riders went out on track before him and broke the Olympic record. It cracked some of his rivals. In response France’s Arnaud Tournant switched to a bigger gear, went out like a maniac and died on the last lap. However, British Cycling had already planned for this eventuality before the Olympics and David B and S.Peters had previously asked Chris Hoy what he would do if riders broke the Olympic record? Chris’ instinctive response was to put on a bigger gear and go out faster. But, the wise heads of British Cycling said no. You keep to your original plan, and what you have worked on for the past four years. Chris kept the same gear, same pacing strategy and the rest is history. This kind of anecdote is both interesting and quite useful. I may write a post on pacing in hill climbs fairly soon. Thomas definitely has sincerity, though on some subjects I would have been interested to read more about. He touches on the media scrutiny and drug allegations that dogged Froome’s performance in France. It would have been interesting to hear Thomas write more on this. But, maybe it would have been harder to keep the relatively upbeat tone of the book. Also, I felt I wanted to read a chapter written by his wife Sara. From this book at least, she comes across as a paradigm of patience and self-giving. In fact, by the end of this book, I had the idea – why would anyone want to marry a professional cyclist? Thomas is a top cyclist but also quite a down to earth personality, which is quite easy to relate to. The book is interesting and enjoyable to read. Thomas goes into great detail about the minutiae of pro cycling but doesn’t mention a single word about doping? As if he’s never observed or even has an opinion on its effect on the sport? C’mon mate.